Here's the speed freak's version of the biggest video game hit of all time. We collected the five minute, time action game paks used in the ''Blockbuster World Video Game Championship II.'' Now it's your turn. The clock's ticking down as you dash through Donkey Kong Country. Forget the bananas -- Just finish as many levels as possible. To make it through eight random levels, you gotta have lots of juice. Think it's easy? Only the few and fleet will ever be able to take up the challenge, because Nintendo minted only 2,500 of this special edition. The score to beat from the pros at Nintendo...... 3,641. 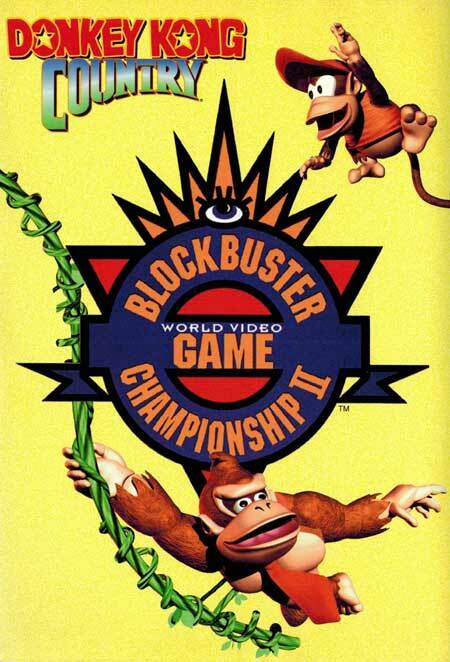 The Donkey Kong Competition cartridge was used in the Powerfest '94 championship and the Blockbuster World Video Game Championships II in 1995. The carts were later sold through Nintendo Power's ''Super Power Supplies'' catalog, housed in a plastic rental-style container with a paper insert for the case artwork.